The comical and cute Red-backed (or Central American) Squirrel Monkey is the rarest of the 4 species of primates that inhabit Costa Rica. In fact, the Southern Pacific Coast of Costa Rica and the Northern Pacific tip of Panama is the only place in the world that this monkey can be found. In the 1970's, over 200,000 squirrel monkeys roamed the rainforests of Costa Rica. Due to deforestation, hunting, and capture for the pet trade, the population is now believed to be less than 5,000 individuals. That's a remarkable plunge of nearly 98% in only 30 short years! 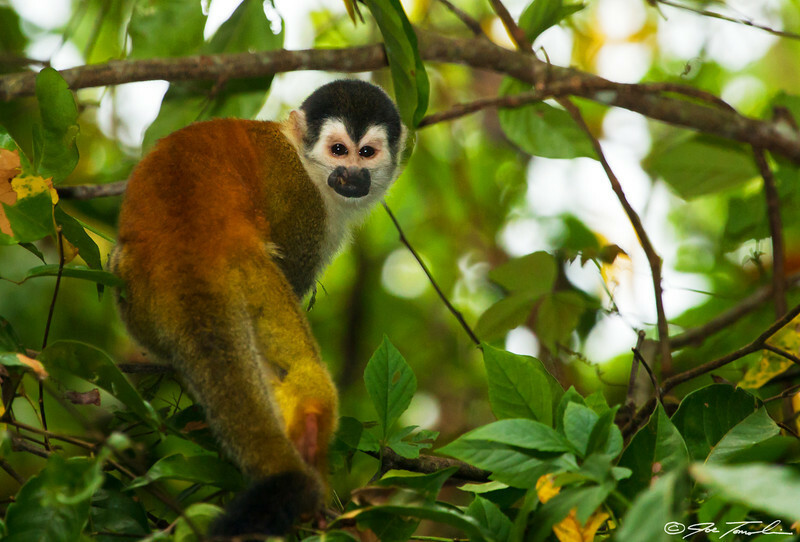 As a result, the Red-backed Squirrel Monkey is listed as a "Threatened" species by the IUCN. We can only hope that the fleeting "over the shoulder" glimpse given by this monkey is not a symbolic farewell for the entire species.